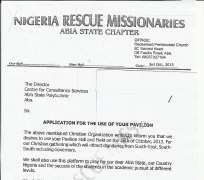 The quick telegram (though sent as SMS) above was sent by the ADC to Rochas Okorocha on the 11th of October, 2013 to the Deputy Commissioner of Police Abia State. This is barely 24 hours to their much planned “inauguration of Nigeria Rescue Missionaries south/south and south /east caucus (we didn't know churches also devolve into caucuses). Abians woke up on Sunday morning inundated with news about how police aborted “Rochas Okorocha's birthday” in Abia. Ordinarly, one would have treated that piece of information from APC crony tabloids as another wild goose chase, but for the sake of Abians and indeed our Imo brothers who still believe in the truth, this explanation will go along way. 2. Rochas Okorocha did not have the courtesy of informing his brother Governor that he planned to visit his State for whatever reason. 4. Because Rochas and his colleague “Missionaries” had ulterior motives, they circumvented due procedure in Abia State Polytechnic and got approval. 5. In the letter cancelling the use of the venue (see attached), the Rector of the Polytechnic regrettably informed them, “the Acting Students Union President who one of your female officials chose to deal with has informed me that they had told you it would disrupt their exam but you ignored her advice”. 6. When students saw the massive mounting of canopies and decorations (with APC colors and logo), presence of massive musical equipment within the school pavilion and field; they alerted the school authorities. The Students Union Government of Abia State Polytechnic wrote to the school on “Disruption of our second semester examinations”. 7. It is important one looks at the scenario that played out. You will judge how it was Abia State Government that disrupted “Rochas Okorocha's birthday celebrations”. 8. Rochas did not, either in writing or text inform His Excellency, the Executive Governor of Abia State that he was coming to Abia for whatever purpose. 9. By the time, Rochas informed the Police through his ADC, they (Rochas and his 'birthday' organizers) had concluded arrangements including, but not limited to preparing the venue and informing his members in Abia State. 10. The Abia State Government may be the owners of Abia State Polytechnic but do not get involved in petty matters like who uses their space. 11. It was therefore unfair to have dragged the State Government's name over an issue that bordered largely on Rochas OKorocha's idea of always playing smart with everything. 13. While one can imagine his other ulterior motives, it is foolhardy for anyone to think that one who sets out to deceive could get a better treatment. 14. May be Rochas wanted the Police in Abia to fold their hands and watch him cause chaos. 15. May be Rochas wanted the students (they started second semester exams amid the Polytechnic strike for over one week before that event) allow Rochas and his “prayer warriors” to disrupt their exams. 16. Abians are wiser and know more than the cheap blackmail being sponsored by Rochas Okorocha. 18. We wonder why he was not proud and courageous enough to inform the relevant authorities that he was the person referred to in the letter as “South/South and South East Governors”. 19. We know that Rochas is crazy about his “Rescue Mission”, but he would realize that Abia is peaceful and secured the way it is and would not be enlisted into any wild goose chase. 20. The last time we checked, neither the Chairman of Christian Association of Nigerian, his PFN counterpart on any other religious leader was notified of this “prayer” that would attract dignitaries from within and around the country. 21. Somebody should remind Rochas Okorocha that campaigns have not started, at least in Abia. He should wait until time for campaigns for him to do that his false might on Abia State. We are 22 years and would stop at point 22.